A couple years back, I got a wild hair and decided to create a website for myself. In addition to wishing to learn for the sake of learning and desiring a place to share photos and ideas, I wanted to create a site for the business venture of myself and my partner, Conal, Awakening Compassion. Conal and I visited the Microsoft company store and purchased a copy of FrontPage 2003 for me. I had tried some open source editors and found those tools pretty tricky for a newbie to use. I bet they're great for experienced webmasters, but I'm much happier in the FrontPage environment, as it's a familiar and fairly intuitive interface. I'm accustomed to learning new software, and have been able to figure out many things on my own. Conal has been a great resource, too. Nothing like sitting next to a computer scientist to give a gal confidence. A complete song list including solo tunes, congregational pieces, choral leads, etc. Some recordings of me singing, perhaps even singing well! Who knows! I'm just getting started. So far, I have learned just enough to be dangerous. Come back and see me again soon. Meanwhile, enjoy your day and I wish you much happiness and peace. New! Check out my blog, The Hollosphere. Just in case you haven't gotten enough of my silliness. I was born in Seattle in Washington State, USA, and lived in the area for most of my life. From 1993 to 2007, I lived in Lake Forest Park, just north of the city. For a few years when I was a baby, I lived in Hawaii with my mom (Barbara) and dad (Gordon) and brother (Scott). Other than that brief period, I've mostly lived in Seattle and consider myself a Seattle native. 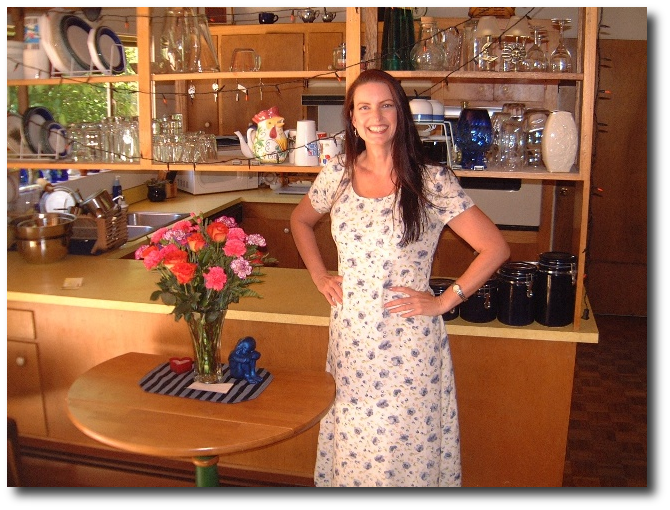 In April 2007, my partner, Conal Elliott, and I moved to his 20 acre property in San Andreas, CA, up in the Sierra Nevada foothills about two hours east of the Bay Area. Our place is a beautiful, secluded canyon with a creek and lots of trees, birds, and animals. Wild animals only, so far, no pets. Our place is adjacent to Conal's family's 60 acres, and we get to enjoy hanging out with his mom, Ann, and other family members. The area, accessed by a long, one-lane, dead-end, dirt road, is known as Murray Creek. Conal and I teach Compassionate Communication, also known as Nonviolent Communication or NVC. Our practice had begun to bloom in Seattle, and now we're in the process of starting from scratch in our new home. I'm a vocal soloist, having performed at Seattle area churches regularly over the years, and am looking forward to connecting with churches in California for spiritual community and music. I love reading, salsa dancing and other ballroom dances, singing and performing, and playing with my laptop and making a mess with html as you can plainly see. Bear with me, I'm learning here! I also love sailing, hiking, backpacking and bike riding, though I haven't been doing as much of those things lately as I would like. Future plans for this site include a page for a detailed bio. Please hold your breath. In the fall of 2006, I returned to school and thus fulfilled a life-long dream. I plan to earn a degree in graphic or fine art eventually. I haven't settled on the exact field of study yet, because it ALL interests me. It may take me a hundred years, but oh well. I'm also studying music theory and piano (more dreams coming true!). Regardless of what I study, I'd like to develop skills that will help me to realize a life of purpose, meaning and joy.